Malema lays charges against Pravin Gordhan and his daughter - SABC News - Breaking news, special reports, world, business, sport coverage of all South African current events. Africa's news leader. Malema has laid five criminal charges against Gordhan and two against his daughter, Anisha Gordhan. 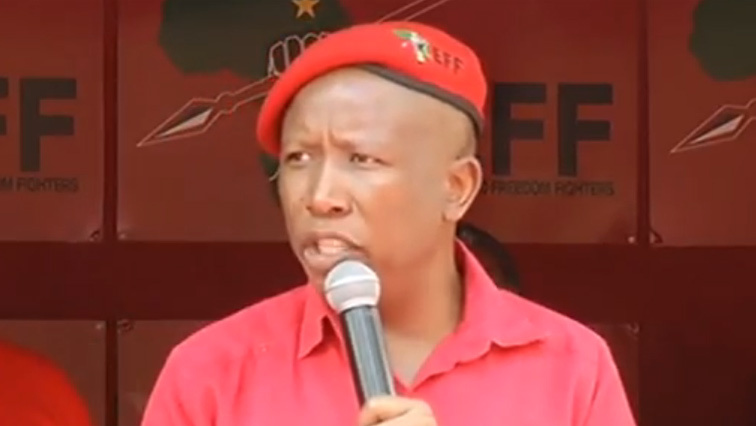 Economic Freedom Fighters (EFF) leader Julius Malema says he has laid criminal charges against Public Enterprises Minister Pravin Gordhan because he knows his rights. Gordhan is facing charges of contravening the intelligence act, money laundering, fraud and perjury while his daughter is facing fraud and corruption charges. Malema claims Gordhan opened and operated an unlawful foreign bank account in Canada which has an account balance of $48-million. Gordhan’s also accused of participating in the formation of the SARS rogue units between 1999 and 2009. Malema addressed the media in Pretoria after laying the charges. “Let’s not be intimidated, let’s not defocus, and let me tell you they’ve taken a political position. They cannot take a political decision and say to us, that we must not take a political decision. They hit you on this cheek and expect you to offer the other cheek, I’m not like that,” says Malema. On Monday, Gordhan laid charges of defamation of character against Malema and Floyd Shivambu at the very same Brooklyn police station in Pretoria. This entry was posted on 27 Nov 2018,02:25PM at 2:25 PM and is filed under Politics. You can follow any responses to this entry through the RSS 2.0 feed. Both comments and pings are currently closed.